Located in the New Bedford Channel at the entrance to New Bedford Harbor. Can be easily viewed from Fort Taber Park. The construction of Butler Flats Light was an engineering feat since there was no rock edge to build the structure on, so a 35 foot iron cylinder filled with concrete had to be lowered into the muddy river bottom to support the 53-foot spark plug type lighthouse within the strong currents of the channel. The same engineer who built the foundation for the Statue of Liberty was called upon in creating the foundation for Bulter Flats Light. Butler Flats light eventually replaced Clark’s Point Lighthouse, which was relocated to Fort Taber in 1869 (later renamed Fort Rodman). Butler Flats Lighthouse is the only lighthouse in the US flying a lighted American flag 24 hours a day. In 1997, inmates from the Bristol County House of Correction, in coordination with the County Sheriff’s and Mayor’s offices, were directly involved in rewiring the lighthouse’s electrical system, and construction on the lighthouse ceilings, walls, floors, and stairway. In New Bedford you’ll find the New Bedford Whaling National Historic Park with its cobblestone streets, specialty shops, and museums. New Bedford’s Whaling Museum displays maritime exhibits and historical artifacts from its hay day in the 19th century, as the nation’s whaling capital. Palmer Island light can be seen from the museum. Fort Taber (or sometimes referred as Fort Rodham) has been restored as a recreational park to enjoy views of the harbor and lighthouse. A lighted boardwalk has also been added. Clark’s Point Lighthouse is located on top of the Fort. A lighted boardwalk has also been added for visitors to relax, or fish off shore. Events are scheduled during the summer months. For those who enjoy hiking, take a good hike that spans over 9,000 feet on the largest hurricane barrier on the East Coast, protecting New Bedford Harbor. At the end you’ll find close views of Palmer Island Light, and on the other end you're very close to Clark's Point Lighthouse, where you can also view Butler Flast light from the wall. Be wary to travel during the daytime with companions. Seastreak to Martha’s Vineyard from New Bedford passes by the lighthouse. 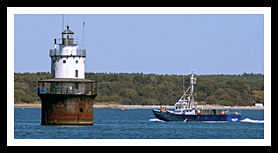 The Cuttyhunk Ferry passes the lighthouse as it leaves the harbor. Take Route 18 south in New Bedford. Route 18 will turn into Water Street and then West Rodney French Boulevard. Continue south and you will see Fort Taber Park, with the fort and the lighthouse at the southern end of the peninsula. From US Route I-95 North in New Bedford, take Exit 15 and follow Route 18 South. Take the “Downtown” exit onto Water Street. Take a right at Frontage Road (Front Street). From Frontage as it veers to the right, go past the pier and follow to MacArthur Drive then turn left. Left at Cove Road onto East Rodney French Blvd. View the lighthouse from the seawall south of Ricketson Street or from Fort Taber Park, which you can visit. These ferries may pass close by the lighthouse coming to and from New Bedford's Harbor for easy photographs, but do not offer specific tours.